As the Manager of Content Marketing for PBA Health, a small pharmaceutical company, I handle all website content. I’m the also the editor of Elements magazine, a B2B magazine the company produces as a soft marketing asset. All of the blog posts the company produces fall under Elements magazine at pbahealth.com/elements. The idea is to provide valuable content to independent pharmacies, while also occasionally advertising PBA Health’s products and services and using the content for lead generation. I write or direct my team of copywriters to write all content for the website. Check out all of the blog posts I produce at pbahealth.com/elements. Want to see just one? Here’s one of my favorite blog posts I edited for Elements magazine. This blog post consistently ranks as one of the website’s top blog posts every week. I came up with the idea after researching business topics that pharmacy owners would find relevant. And I asked my copywriter to craft a detailed blog post that provides maximum value on a complicated topic. 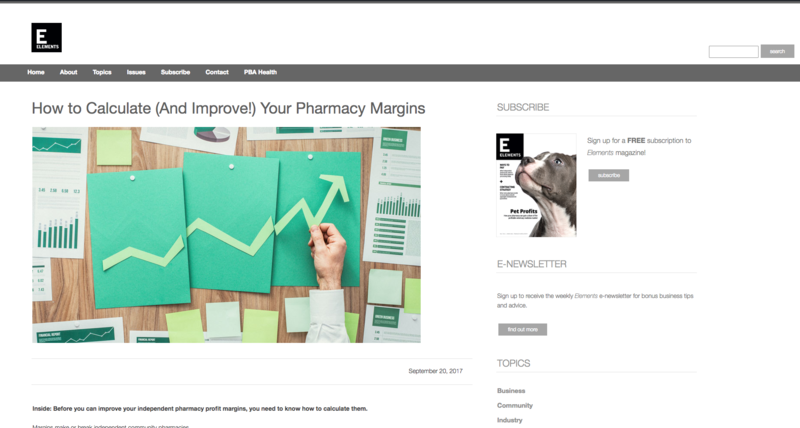 I also optimized it to target the keyword, “pharmacy margins” and gave a plug for one of PBA Health’s services in a subtle way that provides value to the reader.